St. Matthew’s Episcopal Church sponsors and provides a meeting place for Boy Scout Troop 413 of the Golden Spread Council of the Boy Scouts of America. Several St. Matthew’s Church members provide support for the troop and the local council. This group of parish members are trained to bring God’s Word and Holy Sacraments to those in prison. This group is organized through St. Matthew’s Community Ministry committee. Church members, organized through the Community Ministry committee of St. Matthew’s, host monthly Community Ministry Meals the third Wednesday of the month from 5:30-7:00 p.m. at our Parish Hall. We invite everyone in Pampa to come enjoy a meal and fellowship. St. Matthew’s supports Pampa’s Good Samaritan Services along with other Pampa Churches. “Good Sams” provides food, clothing, and utility assistance for people in need. St. Matthew’s Church provides Good Samaritan Services with its physical facilities, provides funding and several board volunteers. 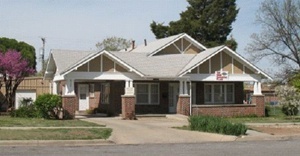 Good Samaritan Services is always in need of volunteers to help during the hours that they are open.